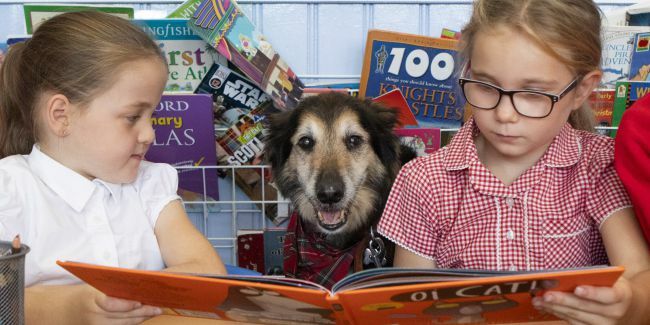 An adorable dog loves helping primary school pupils to read, and even has his own school uniform and backpack. Rescue dog Russell, aged 13, visits Coalsnaughton Primary School, Alloa, Clackmannanshire every Friday afternoon. The elderly dog is the family pet of school worker Kelsie McAlpine, 25, who came up with the idea of bringing him in to meet the children. Kelsie researched the benefits of children having contact with animals, and said she has seen pupils’ confidence soar since Russell first visited the classroom in February. There are only 64 pupils at the school, and they all adore Russell. 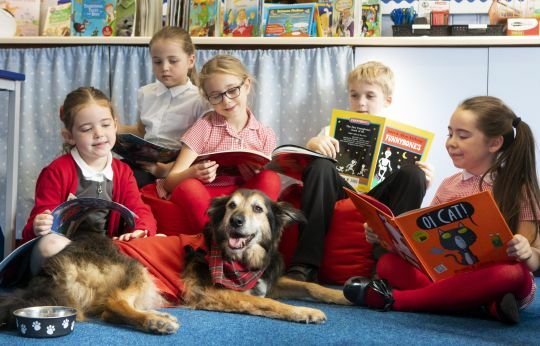 When Russell attends class, he gets to wear a teeny uniform matching the children’s, and a backpack which contains a packet of dog food and Gravy Bones – his favourite treat. Kelsie, who works on the early interventions team, said: ‘A lot of parents ask about when he is coming in. ‘Some of the kids aren’t that confident and I have seen in reading groups where there are four children and they have all been really quiet, that you can hear them getting louder as they read. ‘Dogs do not judge, they just listen. ‘You can see it from the children’s faces.’ Russell, a collie-Alsatian cross, also takes part in the ‘daily mile’ walk which the children go on each day.